This weekend, purchase qualifying items sales-tax free. 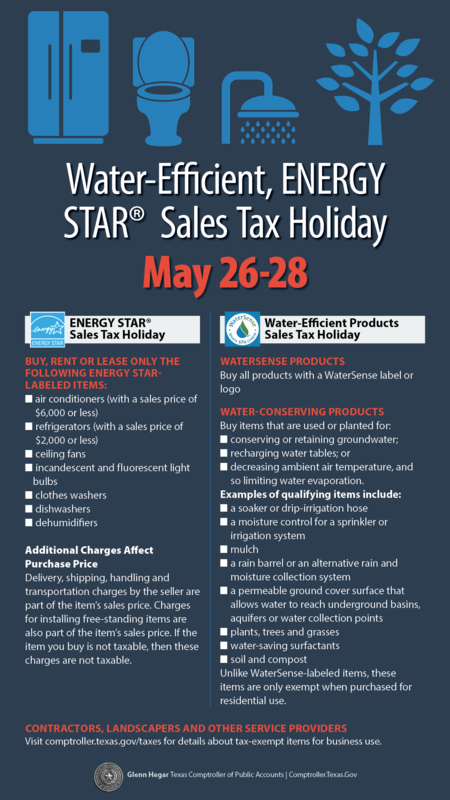 Texas' Water-Efficient Products and ENERGY STAR® sales tax holidays take place Saturday, May 26, through Monday, May 28. Listen to our podcasts to get details about some of the energy, water (and cash!) savings you can expect from purchasing eligible items this weekend. You can buy certain ENERGY STAR® energy-efficient products tax-free during the annual Texas ENERGY STAR Sales Tax Holiday. There is no limit on the number of qualifying items you can buy, and you do not need to give the seller an exemption certificate to buy items tax free. This year's tax-free ENERGY STAR Sales Tax Holiday begins Saturday, May 26, and goes through midnight on Monday, May 28 (Memorial Day). *The ENERGY STAR qualification for programmable thermostats was suspended on Dec. 31, 2009. The ENERGY STAR Sales Tax Holiday exemption for programmable thermostats only applies to those with ENERGY STAR labels before the suspension. Delivery, shipping, handling, and transportation charges by the seller are part of the item's sales price. Charges for installing free-standing items are also part of the item's sales price. If the item you buy is not taxable, then these charges are not taxable. For air conditioners and refrigerators (because they have a price cap), you have to look at the item's total sales price to determine if you can buy it tax free. For example, you buy an ENERGY STAR refrigerator for $1,995 with a $50 delivery charge for a total sales price of $2,045. Because the refrigerator's total sales price is more than the $2,000 cap for refrigerators, tax is due on the entire $2,045 sales price. If a delivery charge is billed "per item", and an invoice has both exempt and taxable items, only the qualifying exempt item's delivery charge is exempt. For a flat-rate delivery charge, the total delivery charge is applied to the tax-exempt items and is exempt if it does not cause the item's sales price to be more than its price cap. If you perform new construction or residential repair and remodeling contract work, you are a contractor. If you repair or remodel nonresidential real property, you are a taxable service provider. For more information, contact us at Tax Help, or call 800-252-5555.